Today, I wanted to share another GMC chart. FYI: GMC is taken from the book GMC: Goal, Motivation and Conflict by Debra Dixon. I also modified my chart after using Carolyn Greene's Magic Conflict Chart from her out-of-print Prescription for Plotting notebook (she said will have a new edition coming later this year!). In addition, I've added some brainstorming notes that I made after reading The Story Equation by Susan May Warren and also hearing her present workshops at conferences. I used these charts for my recent release, “Her Valentine Reunion,” part of the mulit-author collection, BackTo You. In these examples, I’ll be copying and pasting directly from my planning notebook file (you can even see when I had a gem of an idea :)). Sometimes the story doesn’t end up exactly as planned, but for the most part, this one did. External goal, motivation and conflict (EG, EM, EC). Internal need (what they truly need), goal (possibly misguided), motivation, conflict (IN, IG, IM, IC). Plus, something to consider. EM: To look at establishing himself in High Hope/Dahlia and supporting the community. EC: His ex-girlfriend, whom he did wrong and who wants him to stay away from her, works at the place he wants to buy—and hopes to take over the business when her uncle retires. IC: it seems impossible to overcome his reputation and no one seems willing to forgive. Consider: You can’t earn love and acceptance. It’s a two-way street, and you must first risk loving others. EG: Move back to her roots and make a happy, single life for herself near family and friends. Also making her place in uncle’s business so she can maybe take it over someday (a nice living for her single self). EM: Hearing about the mistake Victor made being away from his grandmother before she died. Consider: If you try to be independent and not acknowledge the truth of your desires, you’ll never get what you need. Wound: parents were not involved in his life. They were always busy with their own jobs and didn’t prioritize him, their only child. Praised him when he was successful, so he felt he could earn their attention. Grandmother was only one who showed unconditional love (and he ultimately let her down). Even his job success never seemed to impress his parents. With grandma dead now, he feels adrift—except for the tenuous relationship with Hardy. It’s a life-line. Lie: (child) I must not be very lovable, so I need to be really good at something to earn attention and love. Lie: (adult) People want to associate with me when I’m successful. That’s power to have them want my attention. I like my ability to give them things. If I lose my successful business, I am nothing. Biggest fear: Everything I have crashing down (failure at business). Because that would mean loss of power, and thus, loss of worth. To stay in High Hope/Dahlia he’ll have to sell his business. So buying the country club would be his way to stay in High Hope and be near family, which he dreams of having (and belonging). But to buy it would be to go against the one thing Abbie wants (to keep it in her family and take over for her uncle someday). After he treated her so badly in college (Victor hid fact he needed to succeed more than he needed her), she felt used. Felt like she wasn’t worthy of love. Felt less than. Took a big hit to her confidence. Took a long time to get over that. Men she dated didn’t help. She had to do it on her own and through friends and family. I think I like #2 better. Rather than be used or made a fool of again, she’d rather be single. Not so risky. So feeling God wants her to be single is less risky than having to trust Victor again. Wound: Victor ignoring her and keeping her out of his life even while supposedly dating (because she didn’t have/offer anything to advance his goals). Lie: I’m safer being alone, not depending on anyone else for my happiness. Nothing and no one is worth risking having your love thrown back in your face. So that’s a peek inside my plotter’s brain. It’s a great way for me to think through my story and to make sure I have some decent backstory before I start writing. Often, the next step is to think of scene ideas for each block on my GMC chart. I think of scenes that will show, for example, my heroine’s external goal, or my hero’s internal motivation. This is also a great way to make sure I’m not just telling with a backstory dump. Once I have a lot of scene ideas jotted down, I try to put them in some type of chronological order that makes sense and seems to progress in rising action. This won’t be all the scenes in the story. But it’s a nice skeleton to start with. And of course, that changes as I move forward in the writing—because the story sometimes goes in surprising directions. I hope y’all found this helpful! I’d love to hear whether you use any sort of GMC chart. How do you plan your characters? Giveaway! I’d like to offer to look at your GMC chart or, if you don’t work that way, to look at 1-2 pages of your brainstorming notes. I’ll give feedback or offer additional ideas. Just let me know in the comments if you’d like to be entered. Join some of today's best-selling Christian Romance authors as they introduce you to four new couples who reunite for a second-chance at romance. 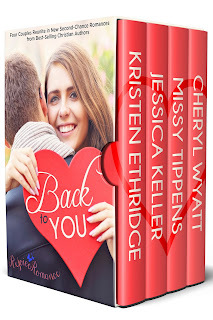 This inspirational romance collection from Love Inspired authors Cheryl Wyatt, Missy Tippens, Jessica Keller, and Kristen Ethridge will warm your heart and each quick, satisfying read will keep you in the spirit of Valentine's Day and holiday romance all year long with stories of true love and happily-ever-after. You're the queen of charts? I thought Pam was the queen of charts. No wait, she's the queen of spread sheets. Me? I'm probably the queen of Doritos. I'm not proud of it. LOL, Mary!!! Yes, Pam is in the Queen of Spreadsheets. And you are the Queen of Laughs (along with Doritos, but who's counting?). Um, I'll take some Cool Ranch Doritos if you've got any, Mary! Love seeing both your stories in that collection, ladies! First, I'm so glad you guys didn't put a give-away-the-store price on that lovely new collection. If we don't value our work, who will??? And Tina finally wrote Lake Effect! I read that opening as a contest entry about a dozen years ago and loved it... having no idea who it was, and might have been before I even knew her... and I have no idea why it's been gathering dust for this long, but you folks will love, love, love that story... I about died laughing reading the opening. I don't know if she changed it or not, but I remember thinking "This is this person's wheelhouse. Whoever wrote this... should write more of them, exactly like it!"... you will absolutely wish she'd gone the distance and given you a full book... but we'll take the novella! And in such a great collection. Double YAY!!!!! Last comment before I head to NYC... Missy. 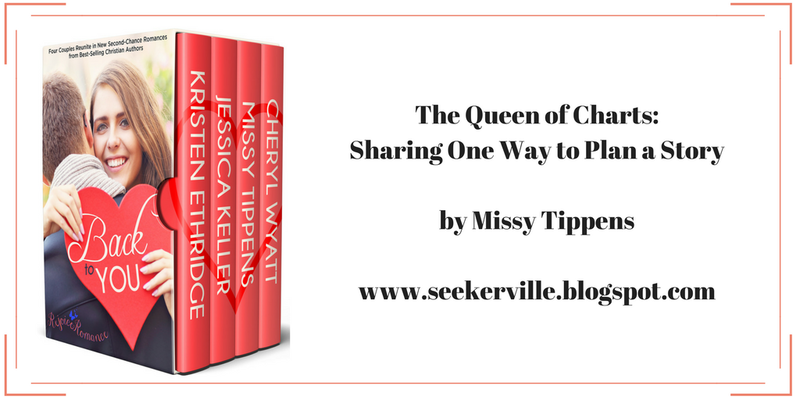 Missy, this is a great blog! Thank you for sharing your plotting process. And for mentioning my Prescription for Plotting workbook. I plan to expand it and have it back in print later this year. Until then, God bless you with your plotting and writing. Carolyn, thanks so much for stopping by! I'll go change the blog post to reflect the upcoming re-release! Let us know when the book is available again, Carolyn. Looks like something I need to read! Carolyn, I'm eagerly waiting for your next edition! I need your expertise! This makes perfect sense to me and my engineer's brain. I love that you've boiled this down to a "simple" (I use that word cautiously, because I know it's not simple!) and logical chart. I think I keep trying to make this whole writing thing much more difficult than it has to be. I hope that comment came off the way I intended it. I love seeing the way other people think and this was a very helpful post for me. Thank so much, Missy! No, I've never heard of those books, but I'll make a point to look them up. Missy, this is great. I'm a chart nut, I have them for everything and especially writing. I made my own GMC chart but yours is better, I might change it up. I also made grids of the main points in the Three-Act Structure, the Seven-Act Structure and the Hero's Journey. My former crit partner Peggy Rychwa, now publishing with Pelican/White Rose, likes a method she calls the "W," it's visual and I always use that at one point in my plotting. Off to do stuff I don't want to do, may be back later. Kaybee, I'm visual and love using Pinterest for my characters and settings. Kathy, I used to use a W plot that I learned very early on at a GRW meeting. I also love to use a writing from the middle chart (James Scott Bell) and the Moral Premise chart (Stan Williams). And I frequently use a chart I got from a class, Plot Via Motivation, with Laurie Schnebly Campbell. Love all these! Which proves that you are the Queen of Charts, Missy! Hi Missy, thanks for sharing, and I'd love to be entered in the drawing for you to look over my GMC. Jackie, I'm interested in learning more about how you use Pinterest. I'm visual, as well. More info, please! I'll be out for a while taking my mom to the doctor. Y'all go ahead and chat about your plotting methods! I love posts like this! Thanks, Missy! Especially when I'm plotting a new story, which I am right now. Plotting methods? Um . . . I do have a worksheet that I sometimes fill out. I'm not good at being organized or methodical. LOL! I'll be back to study this in more depth. LOL, Melanie! Hey, whatever you’re doing is working WELL. Don’t change anything! I’m laying out a spread of Chick-fil-a for lunch! Enjoy! Loved this post and thanks for letting me peek into your plotting process. I really enjoyed The Story Equation and I also loved Discovering Story Magic and currently use a combination of the two of those. I would love for you to give me tips and advice on my plotting sheet, so please, sign me up! LeAnne, thanks for sharing a little about your method. I’m familiar with Discoving Story Magic as well. Another good one. LeAnne, are you a plotter or pantser? I'm a plotter, but I don't use charts as much as lists or outlines...but I make extensive use of my whiteboard. Once I have my story plotted out (using a lot of the same resources you mentioned), I lay it all out on my 2' x 4' white board. The white board is on the wall in front of my computer, so all I need to do is look up to see where the current scene is supposed to be leading. It's great to see how other authors work! Jan, I love the idea of a large white board! Thanks for sharing. Jan and Debby, I do the same thing. I have the white board right where I can see it and those pertinent things I need reminding of throughout the story. Missy, I love me my charts too. :) I rely on them when I'm planning out a story. I could never be a full-on pantser. :) That said, I have to be careful not to do so much charting that I get psyched out by the story, or get so detailed that the story loses its fun, or so involved in making the charts line up that I don't get around to writing. Jeanne, do you use The Story Equation for plotting? Haven't you been to a number of Susie May Warren's retreats? 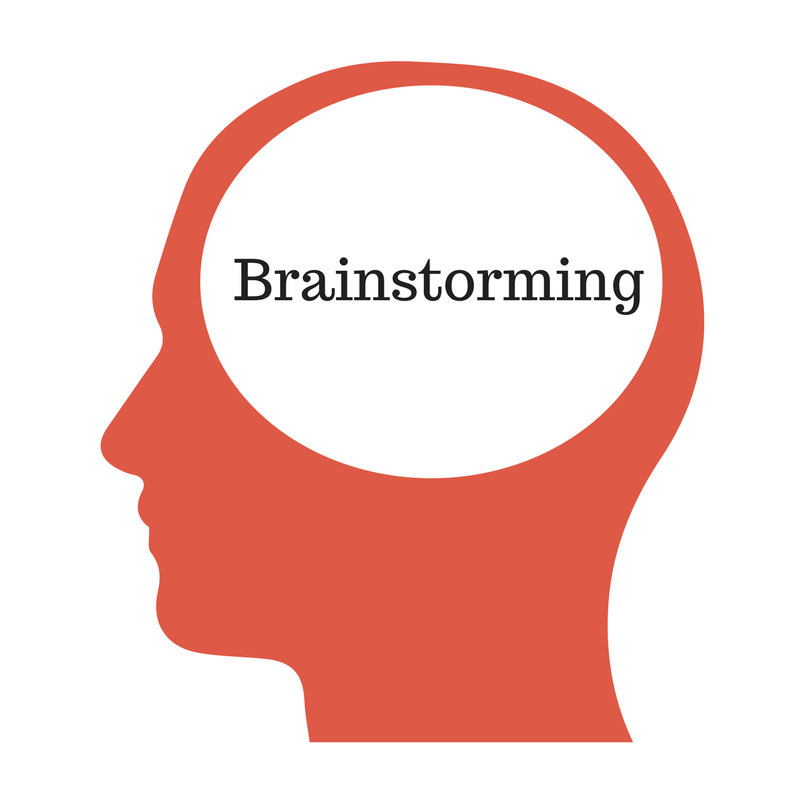 Do you come away with a brainstormed story? Jeanne, I tend to get bogged down, too, if I'm not careful. I can spend a month or more just planning a story! Missy, congrats on your anthologies!!! Cowboys, too! Woot! Yes, you are the Queen of Charts. I enjoyed reading your "chart" outline for the novella. You know your hero and heroine and their GMCs! The story sounds wonderful. Do I see Hallmark movie, perhaps? I watched Rachel Hauch's Hallmark movie over the weekend and enjoyed "Once Upon a Prince!" Don't we all want to see our stories as a Hallmark movie now? How fun would that be! Debby, a movie would be a dream come true! :) I've been thrilled for Rachel and Teri Wilson and others. Thank you for sharing your wealth of information. I need to learn how to use a chart. I'd love to be considered for your chart evaluation critique. Thanks and have a blessed day. Bettie, Debra Dixon's book is great, if you don't have a copy. Understanding GMC, as Missy went into so brilliantly, is important. That would be the first book I'd suggest for your own writing library. Bettie, I hope you'll give the GMC chart a try. I'll be sure to enter you! Thanks. I'll check into it. Nicki, as I told Bettie in the previous comment, consider getting Deb Dixon's book. She explains GMC so well. Debra Dixon's GMC was such an "AHA!" moment for me when I first started writing. As I read it, I wondered why I hadn't thought it out myself before. I use it with every book I write now! Yay for GMC charts! Such great novella collections! I can't wait to have a little more time to read through each story. Thanks, Beth! I hope you enjoy them. Thank you for this post, Missy! I'm starting the story equation today, and love using GMC charts. I never start a story without them. Right now I'm reworking some character GMCs and would love to be entered in the drawing! Natalie, I hope the work goes well! I've got you entered. 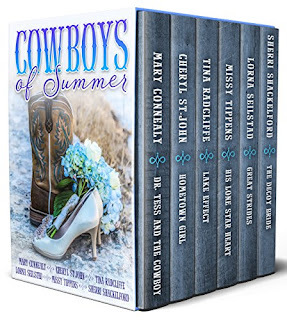 Is it really true that nice Christian girls, as you wrote, "wrangle … handsome cowboys… into romance?" Oh my, ever since Eve! BTW: I've been debating ever since last night whether to read your post before I read your, "Valentine Reunion", novella. Finally I read the post only to discover that there was no spoiler for the novella. I still don't know what happens or how it happens. All you did was raise a lot of questions that I now have to find the answers to. I'd call it a 'teaser' not a spoiler. Question: When do you write your Moral Premise? If every scene must reflect the MP, then I like to write it first. My favorite strategy is to write a 'stand up and cheer' ending first. That way, even if you pantser, wherever you are in your story, you always have a target to shoot for…a lighthouse that will safely bring you home to a finale that will sell your next book! Well, now I can enjoy the novella with full understanding! Hope you enjoy the story! By the way, I almost always know my ending early on. I also know my middle (thanks to JSB's book). You're right about it giving me something to head toward. "…you will absolutely wish she'd gone the distance and given you a full book... but we'll take the novella!" It's always been my view that a really good novella will have a story that is so rich that the author will forever regret 'wasting' it on a novella when it could have been a great novel. A novella is not a way to present a lesser story. It's a way to present a greater story, a big diamond of a story, in a little box. Novellas should delight the reader! Vince said: "A novella is not a way to present a lesser story. It's a way to present a greater story, a big diamond of a story, in a little box." I love that quote, Vince! Missy, you make brainstorming/plotting sound SO easy! :) Some friends are brainstorming later this week, and this is so helpful. I like using the GMC to plot, The Writer's Brainstorming Kit by Pam McCutcheon, and bubble plotting helps to just go in every direction if I'm stuck. Pam, I bought the Brainstorming Kit but haven't used it yet. I look forward to trying it. Isn't it fun to have so many ways to do our work?! Sometimes the best way to brainstorm is to seed the clouds first. Wow, this looks a lot like my worksheet I created for myself, most of which I got from a workshop I attended with Susan May Warren and Rachel Hauck! :-) I should probably use it with my new story. The funny thing is, my story ends up veering away from nearly everything I write down. LOL! Oh well. I still think it helps. Melanie, I'll tell you what I told Mary. Whatever your process, you do it very well, so don't overthink it! Great post, Missy! I always enjoy seeing how my author friends plan and plot their stories. :) I'll admit I'm pretty much a total SOTP writer, but I do jot down notes to myself when something pops into my head. A couple of years ago, I decided I must be the only writer who didn't own a copy of Debra Dixon's GMC book! So my sweet oldest daughter went online and ordered a very nice hardbound copy for me---I was thrilled! :) Now I need to be more consistent in creating GMC charts for my main characters, so your post has encouraged me. Patti Jo, that was so nice of your daughter! I hope you have fun with it. Like I said earlier to someone, pantsers can always use charts after the fact to “check” the story elements. Wonderful post, Missy. I've had Deb Dixon's GMC book for years. I think it was one of the first writing books I ever bought. Mindy, that’s a good point. We don’t want to get bogged down. I have to continually check myself on that. Missy, your process fascinates me. I am a very organized person, but for some reason, my brain will not let me chart. If I start to chart or take notes, it's like my brain kicks into overdrive and spews ideas and before I know it, I've written three pages of "notes" that aren't really notes at all. It's just easier for me to sit down and write. I guess that confession officially makes me a panster. I wish I could make charts and notes. I think it would help tame the ideas that are constantly churning in my head. I enjoyed reading through your chart, though. I admire your process. Karen, I’m glad you do what works for you! Our brains are all different. It sounds like you brainstorm as you write. That sounds very efficient to me! Missy -- I always enjoy learning about the creative processes of other writers. Stories seldom come to me "whole cloth" like they do to some with a ready-made GMC. I get a core "idea" (ideas are a dime a dozen) and then it takes lots of work to build a true story on that. Thank you for sharing--AND with helpful examples! I'd love help with my GMC, since I'm new to dual POV romance writing! What a nice offer and I found your post to be extremely helpful. I'm the type of person who needs examples. Thanks so much. Liz, I've got you entered for the drawing! I'm glad examples help! I had a chart similar to this but yours added a nuance that really helped me figure things out. Thank you! I'm glad it helped, Sparks of Ember! Can y'all hear me ripping my hair out by the roots?? I'm working on my daughter's financial aid forms!! Hi Missy - thank you so much for your post on GMC. I've heard about it a few times already so I had bought Debra Dixon's book a while back, though the virtual spine hadn't been cracked yet. Your post gave me the kick I needed to begin reading this incredible resource and I've been working with GMC charts all weekend. I cannot believe the difference! My original idea has blossomed into something solid, and has definitely taken a different turn than I originally intended. Looks like with my first experience using GMC that this will be definitely part of the process for future works. Thanks for sharing!